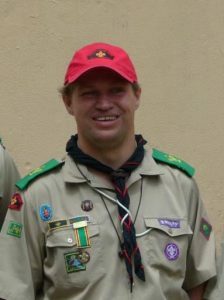 As we continue to highlight the commitment and joy that adults bring to the Scouting Movement we now focus on Peter le Roux. Peter is currently the Regional Team Coordinator for Rovers in Gauteng. So after a lifetime of Scouting and Rovering, which memory brings a smile to his face? “For my B-P Award expedition my Crew and I rowed from Frankfurt to Deneysville along the Wilge River and Vaal Dam. We spent two nights rowing under a meteor shower, and camped on an island in the middle of the river. It was a great challenge that took many months of preparation and pushed myself and my crew to learn and do new things.” he reminisces. 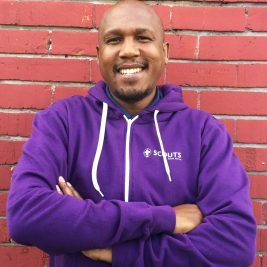 Apart from specific technical skills, Peter uses the life skills that Scouting transfers to its members in his professional life. Abilities such as how to lead and work in teams, how to plan and organise projects and how to be involved in the community. “Not only children, but all young adults learn a lot of things that they can apply in everyday life. Rather than just being useful on camps, Scouting prepares us for life- what B-P called ‘training in citizenship’”, Peter concludes.